If you want to know what collagen supplements are, why people supplement with them, and how they can improve your joint health, then you want to read this article. Joint pain often occurs when your immune system attacks the healthy collagen in your joints. Taking collagen supplements teaches your body to stop breaking down joint collagen. The only kind of collagen supplement that’s proven to reduce joint pain is undenatured type II collagen. If you’re like, well, most everyone, you have at least a little bit of joint pain. Maybe it’s your shoulder, or your knee, or your hips, and maybe the pain comes and goes or maybe it lingers. Maybe you’ve tried things to sort it out like stretching, resistance training, foam rolling, anti-inflammatories, and natural supplements like glucosamine chondroitin, only to be disappointed. And now you’re looking for information on yet another supplement that promises to finally soothe your joint pain—collagen. Well, the long story short is yes, it absolutely can. As with all natural supplements, some work better for some people than others, but there is good scientific evidence that collagen can indeed reduce joint pain and inflammation and even benefit people with healthy joints. By the end of this article, you’re going to know what collagen is, why people supplement with it, how it can improve your joint health, the best kind of collagen to take, and more. Why Do People Supplement with Collagen? What Are the Benefits of Collagen Supplements? What’s the Clinically Effective Dose of Collagen? What Types of Results Should I Expect with Collagen Supplements? Do Collagen Supplements Have Any Side Effects? What’s the Best Type of Collagen Supplement? Collagen is the main component of your body’s connective tissues, which means it serves as the primary building block for various things in it, including your skin, teeth, cartilage, bones, and tendons. Type I collagen is the most abundant collagen of the human body, and is present in scar tissue, tendons, ligaments, skin, bones, and more. Type II collagen is the collagen that preserves joint function and protects them against damage. The main reasons people take collagen supplements are to improve their joint health and reduce joint pain (type II collagen supplements), and to improve the appearance of their hair, skin, and nails (type I collagen supplements). You can get collagen from your diet by eating foods like organ meats, whole fish, and bone broth, but most of us don’t serve those up very often. This is why collagen supplements are a more convenient and reliable way to reap the benefits of increased collagen intake. There isn’t much research available on type I collagen supplements, but they may be able to improve skin elasticity and wound healing. Type II collagen supplements are much more promising, however, as studies show they can markedly improve joint health and function. To understand how, we have to look at how joints commonly become dysfunctional and painful. Your joints are lined with a flexible tissue known as cartilage, which lubricates them and absorbs physical impacts. Healthy cartilage makes it easy to move around and keeps your joints pain free. Most people assume that if they’re having joint problems, exercise is to blame. All that repetitive running, squatting, and benching must take a toll, right? Not really, it turns out. Sure, doing too much exercise can make for achy, inflamed joints, but research shows that various kinds of exercise that you’d expect to be harmful to your joints, like long-distance running and weightlifting, aren’t associated with cartilage loss or joint damage. In fact, regular exercise seems to help keep your joints healthy and working properly. Why do so many athletes and exercise enthusiasts suffer from joint pains, then? Well, many are dealing with a condition unrelated to their physical activities known as arthritis, which is often caused in part by an unwanted immune response to joint collagen that eats away the cartilage. In other words, your body’s immune system can mistakenly target and attack joint cartilage as a foreign, unwanted substance, and thereby undermine the structural integrity of your joints. Studies show that Type II collagen can help alleviate this condition by “teaching” the immune system to stop attacking the proteins in joint cartilage, which in turn can significantly improve joint health and function and decrease or even eliminate pain and swelling. In other words, type II collagen supplements can work like a natural vaccine of sorts, allowing your body to recognize its own joint collagen as a safe substance, thereby switching off the autoimmune response. And the best part about type II collagen supplements is that these effects have been demonstrated in people with arthritic conditions and people with healthy joints. This is significant because it makes type II collagen one of the only supplements known to help preserve joint health and function (as opposed to just treating joints that are already damaged and dysfunctional). For type I collagen, there isn’t a clinically effective dose because we don’t really know if actually does anything. If you want to give it a shot, though, then go with 2.5 to 3 grams per day. For type II collagen, the clinically effective dose of collagen is between 10 to 40 milligrams per day for improving joint health. And yes, that’s a rather large range for dosing, but that’s only because studies have shown benefits using various doses, and it isn’t clear if more is better. Research clearly shows that 10 milligrams is effective, but not that two, three, or four times that amount is necessarily better. As with all natural supplements, don’t pin unrealistically high expectations on collagen supplementation. It’s not going to magically give you vibrant, glowing skin and nails and luxuriant hair, and joint pain is a complex, mysterious phenomenon that is notoriously intractable. You shouldn’t expect any results from type I collagen, since research indicates it’s probably a dud. If you want to do everything you can to keep your joints healthy and pain free, then taking a type II collagen supplement is a wise choice. The main benefit that people notice when supplementing with type II collagen is fewer joint aches and pains during everyday activities, and especially during and after exercise. Don’t expect immediate results, though, as it typically takes several months for a type II collagen supplement to noticeably impact joint health and function. Collagen is about as harmless a supplement as you can find. There’s a small percentage of the population who are allergic to some forms of collagen, but it’s exceptionally rare. If you’re fired up to buy some collagen, make sure you read this section because not all type II collagens are the same. The only kind of collagen supplement that’s been shown to significantly improve joint health is undenatured type II collagen. “Undenatured” means that the collagen proteins haven’t been broken down or modified during processing. Popular methods of commercial processing use chemicals and heat to alter the collagen’s basic form (to denature it), and research shows that denatured collagen can’t produce the same beneficial results as undenatured collagen, which is its more natural form. This is why my joint supplement FORTIFY contains undenatured type II collagen. 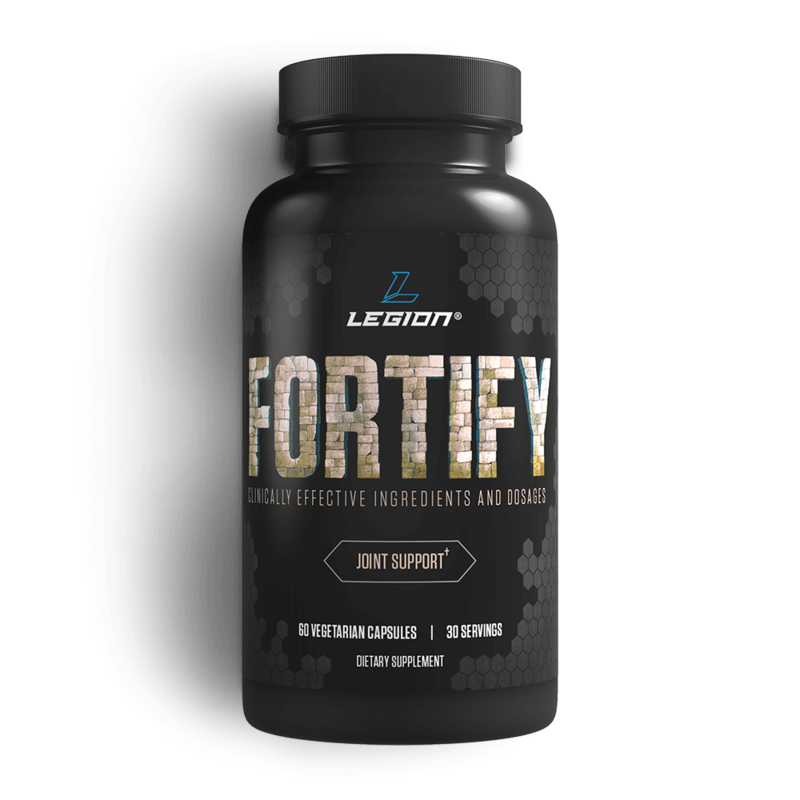 The bottom line is if you want healthy, functional, and pain-free joints that can withstand the demands of your active lifestyle, then you want to try FORTIFY today. If you want to improve your hair, skin, and nail health, then type I collagen supplements probably won’t help. If you’re one of the many people who regularly struggles with joint pain, however, then there’s a good chance that taking a type II collagen supplement can help. It can reduce joint inflammation and swelling and stop your body’s immune system from destroying the cartilage in your joints. You have to be careful to pick the right kind of collagen supplement, though, as undenatured type II collagen is the only one that’s been proven to significantly improve joint health. What’s your take on collagen supplements? Have anything else to share? Let me know in the comments below!